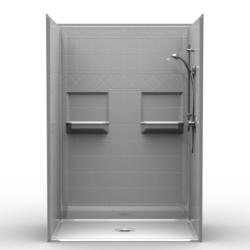 Accessible Showers: We Hate Wet Bathroom Floors! The problem with accessible showers is that because you have no threshold to step over, the water has no problem accessing the rest of your bathroom floor. 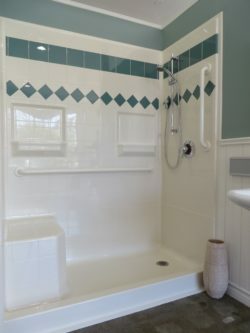 If you have shower curtains that don’t reach all the way to the floor, or you have a slow drain, you can end up with a slippery, wet floor that causes further safety problems. The best solution is actually very easy and quick to install. Water Stoppers or rubber dams can be fitted to existing showers or can be added easily to ORCA HealthCare accessible showers. 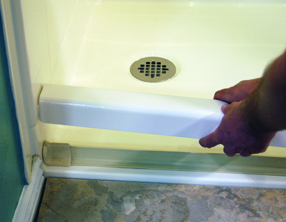 The rubber ‘T’ shape of the dams collapses easily under the pressure of a wheelchair, so you can get in the shower but the water can’t get out. Water Stoppers are self-adhesive so you don’t have to worry about making a sticky mess with epoxy and they take around 5 minutes to install.